Very recently I showed you guys in a haul that I got a new eyeshadow palette, by Tarte. Tarte is a really, really, terribly difficult brand to get your hands on here in the Netherlands (and probably lots of other European countries), so I was very excited when I finally found a way to get my hands on one of their products. The palette I ordered is called the Tartelette In Bloom palette. It contains lots of gorgeous neutral shadows and according to the rest of the internet, the quality is absolutely amazing. Today I’m going to review it. If you’re interested in finding out if this palette is truly amazing and whether or not it’s worth the splurge, keep on reading! This Tarte palette comes in probably the prettiest packaging that I have ever seen. I’m not kidding, it’s literally the most gorgeous thing in the world. The lid is covered in purple and pink splashes of watercolour paint and in the middle are golden letters that spell out the name of the palette and the name of the brand. I really love how colourful and bright the lid it, it really lightens up my mood every single time I see it. The palette itself is pretty thin, which surprised me. For some reason I though it would be way thicker, but I do have to say that I prefer this. It’s way more convenient for travelling and it takes in less space in my collection. When you open up the palette you’ll find a big mirror, the size of the lid, and all of the eyeshadows. Overall I’m absolutely in love with the entire look of the packaging. It’s convenient, pretty and colourful. I really think Tarte did a good job when it comes to creating this packaging. It’s just stunning. When you open up the palette you will find 12 gorgeous eyeshadows. All of them are made with Amazonian Clay, which is kind of Tarte’s trademark and therefore they all have a very nice texture. They also have a very specific scent to them. It’s not super strong and I personally do kinda like it, but even when you don’t like the scent I don’t think it’ll actually bother you since it’s not even that strong at all. The Tarte Tartelette In Bloom Palette contains, as I mentioned before, 12 different colours of eyeshadow. All of them are neutral and most of them are matte. Only a few shades, 3 to be exact, are shimmery. I really like that about this palette. Usually I’m all about the shimmers, so I don’t have that many good matte eyeshadows. It’s great to finally expand my collection a bit this way. As I mentioned all of these shadows have the Amazonian Clay thing in them. Therefore they have a very special and nice texture. They are not creamy, but also not super powdery, it’s a bit in between. They are very intense and it only takes a layer to really pack the colour on and aside from that these shadows are also very easy to blend. I really think the texture of the eyeshadows is what makes this palette so unique, compared to other more high-end eyeshadow palettes. Let’s start with discussing the colours, one by one. Charmer – Charmer is my favourite highlighter in this palette. It’s a bit of a creamy white colour without any shimmer to it. It’s perfect for highlighting the brow bone, but it’s also great for all over the lid when you’re going for a very natural eye look. Flower Child – Flower Child is a bit of a camel coloured matte eyeshadow. I like using it as a transition colour in the crease. It makes blending a lot easier and it has a very nice texture to it. Funny Girl – Funny Girl is probably my favourite colour out of all of the eyeshadow in this palette. It’s a very pretty shimmery champagne eyeshadow that is perfect for all over the lid. It makes you look very fresh and awake and it looks good with pretty much every other eyeshadow in this palette. Jetsetter – Jetsetter is another matte brown shade. It’s a bit darker than the other ones in here and I like it as a crease colour for days when I’m going for a more natural look. It’s really great for that. It’s also perfect for filling in your brows. Smarty Pants – Smarty Pants is another matte brown shades. Even though there are quite a lot of matte brown shades in this palette, they are all very different and therefore great to have. This one is a bit warmer than Jetsetter is and it’s another perfect transition colour or crease colour, depending on how dark you like your eye looks to be. Sweetheart – Sweetheart is a very special shade. It is a matte brown shade, but instead of being either orangy or greyish, it has a touch of pink to it. It’s very special and unique and I think it’s really pretty. Rocker – Rocker is one of the three shimmery shadows in this palette. It’s a very pretty, shimmery, cool brown shade. This is one of my favourite colours to use as a crease colour on days I want my look to be pretty shimmery. It’s very intense and has an amazing texture. Firecracker – Firecracker is a lot warmer than Rocker is. It’s more of a coppery/rusty shimmery brown. I really like this as well. I feel like this creates a softer look than Rocker does, so when I feel like that, I use this. Otherwise, I mostly use Rocker. Rebel – Rebel is another matte brown colour with a warm undertone. It’s like the matte version of Firecracker. I think it’s really pretty and perfect for everyday. I think that for redheads this could be a great eyebrow colour as well! Smokeshow – Smokeshow is the matte black colour of this palette. There is one in pretty much every single palette, and to be honest, I hardly even use them. I do have to say that I like how intense it is, but aside from that there is nothing really special about it. Activist – Activist is a very nice dark matte brown colour. It’s perfect to darken up the crease with if you’re going for a more intense and dark look, which is what I want most days. I think it’s really pretty and I love how pigmented it is. Leader – The last colour is Leader. Leader is the warm version of Activist. It’s dark and warm and I love to use this in combination with Firecracker. It’s just a really pretty combination and I wear that a lot. 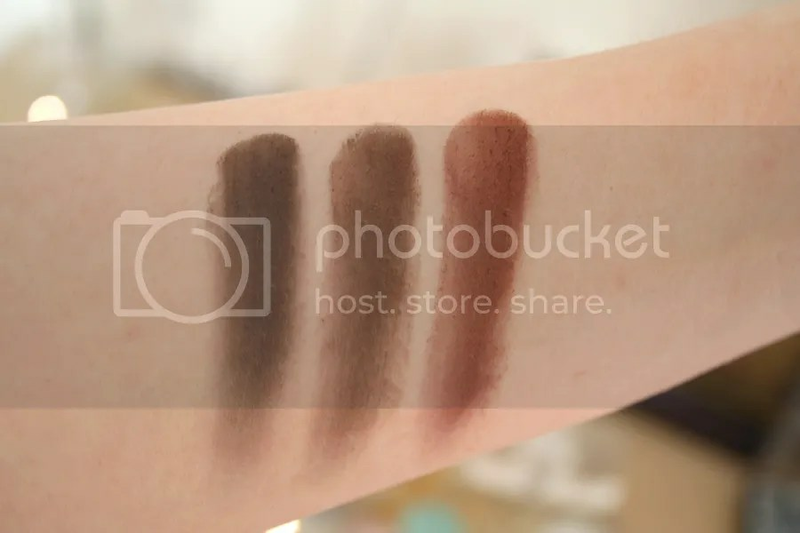 As you can tell from the swatch pictures, every single shadow in this palette is very pigmented. From the mattes to the shimmery shades, all of them are incredibly intense. The shadows are absolutely amazing to work with, the blend really nicely and it’s pretty much a fool proof palette. Staying power wise it’s also amazing. These shadows stay in place literally all day and they never lose its intensity, not even after wearing them for an entire day, not even a long and heavy day. I think that’s very impressive. Overall I think this Tarte Tartelette In Bloom palette is the best palette I have ever tried. I love how nice the eyeshadows are. All of them, every single one, is so pigmented and the texture is really great. I also love the colour selection, all of them are so pretty and perfect for everyday wear. I absolutely love it and I highly, highly recommend it! The Tarte Tartelette In Bloom Eyeshadow Palette is available at the UK QVC site for £31,68. That was it for today. I hope you enjoyed reading this pretty long review and be sure to let me know how you like this palette! De verpakking is echt gaaf zeg! En een hele mooie inhoud. Dit palette straalt echt luxe uit! Ik ben altijd nieuwsgierig naar dit merk. De kleuren zijn precies wat ook bij mij zal staan, al denk ik dat ik nog even vasthou bij Gwen palette, maar even. 😉 Maar zo’n palette als dit tarte is zeker handig voor de dagelijkse look. wat een mooi palette zeg! bij matte kleuren denk ik niet snel aan een palette dat mij heel erg aanspreekt, maar dit palette vind ik toch wel heel mooi qua kleurkeuze. en die shimmery oogschaduws vind ik sowieso echt mijn smaak. Ik snap wat je bedoelt! Ik ben normaal ook niet echt aangetrokken tot matte tinten, maar in dit palette vind ik het juist heel erg mooi! Wauw, wat een prachtig palette! Die kleuren en verpakking ♥ En wat grappig dat de oogschaduws geuren hebben.. ik wil ze ruiken, haha! Heerlijk ook dat er zoveel matte kleuren in zitten. Merk dat ik daar vaker naar grijp lately. Activist en Sweetheart zijn m’n favo kleuren uit het palette!